Hope your all enjoying this wonderful weather Dublin is having at the moment. I wish it could last all year! Keeping your teeth healthy and looking the best is part of all our daily routines. Most of us (well I know I have) have tried teeth whiting products etc. But do they really work? The answer is no because their effects are not permanent and only last for a couple of weeks or even days. 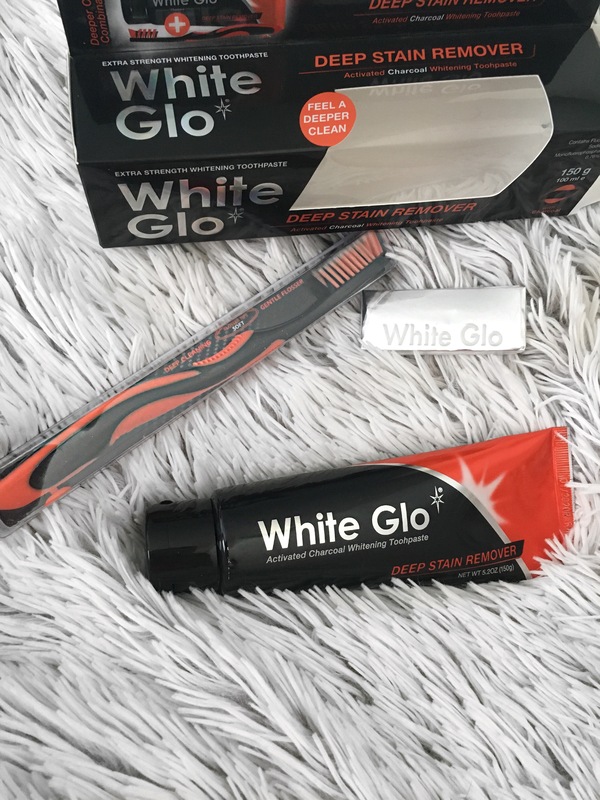 Recently I was sent the new White Glo Deep stain remover activated charcoal whitening toothpaste. This toothpaste is a deep stain remover toothpaste formulated with activated Charcoal to remove stains, yellowing and discolouration on teeth as well as fighting germs and bad breath. The actual toothpaste is a light gray, almost black in colour!!! Even though it may not look great it still has a really fresh minty taste and it froths up white like any other toothpaste when your brushing your teeth. 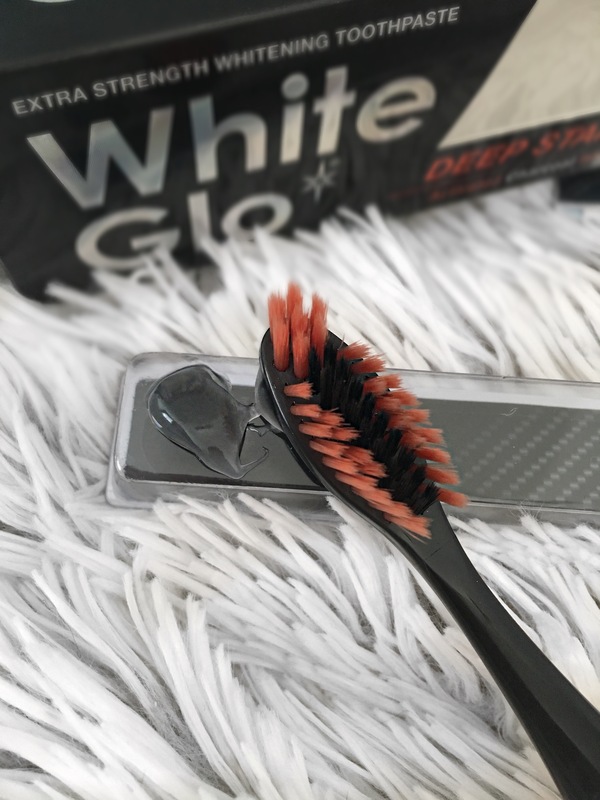 The toothpaste also comes with a special small black and orange White Glo X-Action toothbrush, which has bristles infused with charcoal and the criss-cross action bristles on the brush have been designed to work more effectively with the micro particles in the toothpaste for a better result. The pack also comes with a small bonus pack of dental flosser toothpicks designed to be used between the gap of the teeth to get rid of any materials that may get caught up between the teeth. 1. Use 1-2 times daily (or as recommended by your dentist)to replace your regular toothpaste. 3. Electric toothbrush users can also use this toothpaste by placing a pea sized amount to the brush. 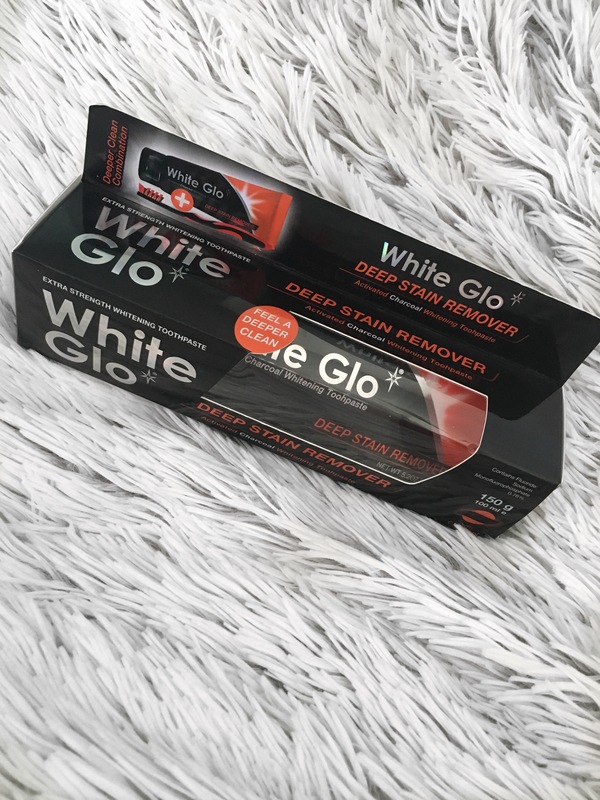 I have used White Glo products before and I found them really good. When I tried this out first I didn’t really notice much difference in the colouring of my teeth but they did feel really fresh and clean. After continuous daily use of this toothpaste I wouldn’t say my teeth are amazingly white but the yellowing and stains that are on my teeth from having braces and drinking too much tea have definitely reduced and I can see a noticeable difference myself in my teeth. This toothpaste is safe to use and has been designed to be used daily in replacement of your regular toothpaste so if you want to see some results and differences in your teeth then I would highly recommend using this product daily. I brush my teeth twice a day once in the mornings and once at night and for the past 2 weeks I’ve been using this in replacement to my regular toothpaste. This looks like a great product at a really great price!